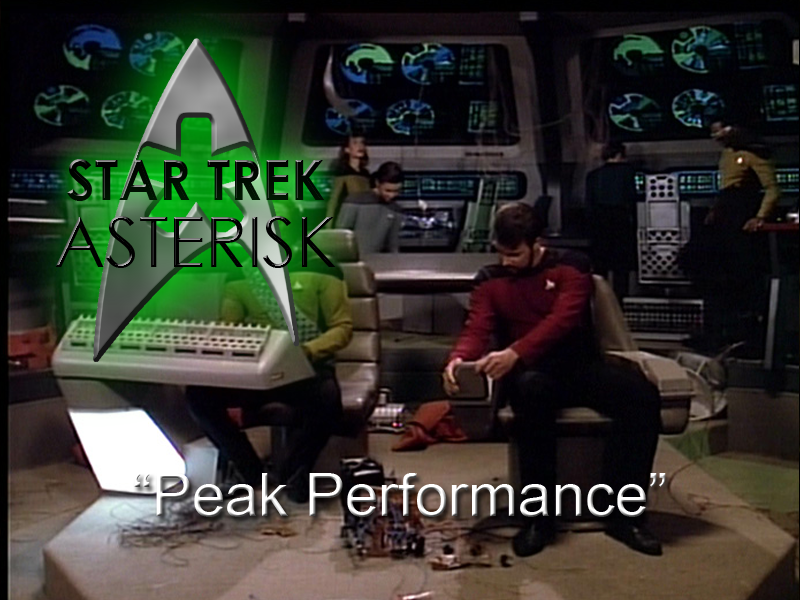 Star Trek: Asterisk "Peak Performance"
Sirna Kolrami comes on board the Enterprise to oversee war games and basically insult everyone's intelligence. Picard thinks that, because there are Borg now, the Enterprise should be prepared for battle, so he's bringing on board Sirna Kolrami, a Zakdorn who is known, along with his entire race, for his strategic skill. Kolrami is going to initiate a battle simulation using the USS Hathaway which is an 80-year-old derelict ship. Picard will assign a member of his crew as captain of the Hathaway and this captain will have two days to make repairs before the games begin. Picard has chosen Riker, and Kolrami is not very excited about this. So Picard gives Riker command of the Hathaway and gives him his choice of crew, except for Data who will act as first officer of the Enterprise while Riker is away. Riker choose Worf and Geordi, asks permission to bring Wesley on board to observe, and then he does the unthinkable. 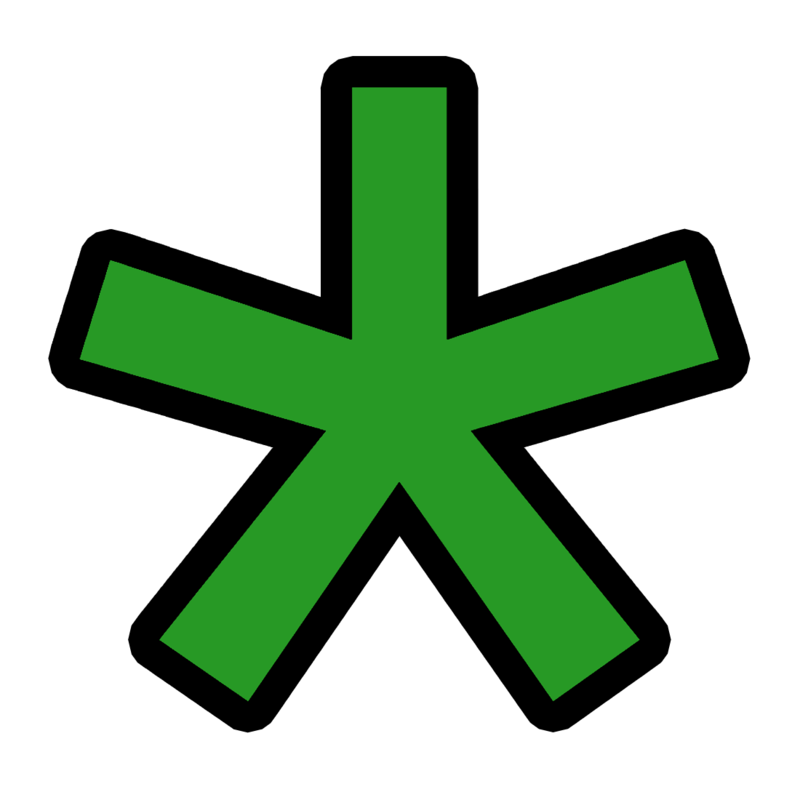 Kolrami is a level three master at the video game Strategema. Riker challenges him to a game. Not because he thinks he can win, or even that he has a chance, but just for the honor of playing a level three master. 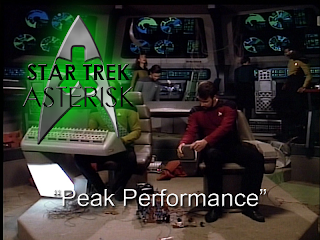 While some of the rest of the crew watch, Riker loses after playing only 23 moves, but during the course of the game, Pulaski is inspired to play with her toy robot some more. She thinks Data should play against Kolrami because he'll win and knock Kolrami down a few pegs. Stop messin' with my boy, yo. Well, Kolrami accepts this challenge and ends up beating Data. Which, for some reason, is surprising because Data is evidently supposed to be perfect. Thinking this to be the case, Data goes to his quarters to run diagnostics and find out what's wrong with him, abandoning his duties as first officer. Meanwhile, the real first officer, Riker, is setting up on the Hathaway, which, let's be honest, is in complete shambles. But the real bummer is that there's only a few fragments of dilithium left in engineering and no antimatter. When he realizes this, Wesley gets a brilliant idea and asks for permission to beam back over to the Enterprise to "turn off an experiment he was running." But, instead, he takes the experiment, which contained antimatter, and plugged it into the Hathaway, giving them warp capability. Meanwhile, Data is having an intelligence crisis and Pulaski and Troi are doing everything they can to boost his confidence. Turns out, all they can do is not enough, so they approach Picard about the problem. He goes to Data's quarters and assures him that it's possible for him to do everything correctly and still lose. This giving Data the confidence he needed, he abandons his diagnostics and continues his duties as first officer. LET THE WAR GAMES BEGIN! Picard starts off with an easy maneuver that's meant to simply find out what Riker is up to. But Worf has an ace up his sleeve. 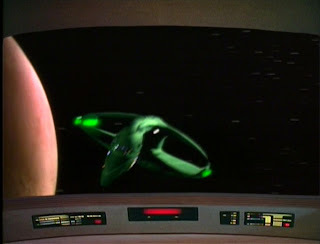 He hacks into the security scanners of the Enterprise and makes it look like a Romulan ship is behind them. While Picard deals with the Romulan ship that doesn't exist, Riker fires on the Enterprise with war game lasers and scores a few points. While Picard recovers from the attack, anther ship shows up on scanners. This time it's Ferengi. Not thinking that Riker is smart enough to move on to other tactics, Picard believes it to be another shadow... until it actually fires on the Enterprise. They put their shields up quickly and hail the Ferengi. They think that because they were about to destroy, but are now protecting the Hathaway, there must be something valuable inside of it. 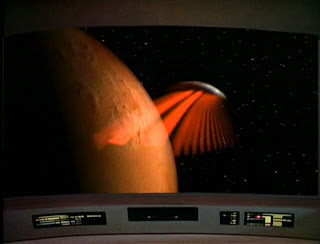 They threaten to destroy the Enterprise to get to it, unless they give it up in ten minutes. Picard hails Riker and Riker reveals that they'd gained some warp capability, so that gives Picard an idea. He hails the Ferengi again and says that the ship is theirs with which to do as they please. So he fires on the Hathaway, and at the same instant, the Hathaway warps away. To the Ferengi, it looks like the ship was destroyed. Angry at this, they begin to fire on the Enterprise, but then their security scanners show another Federation starship is coming. 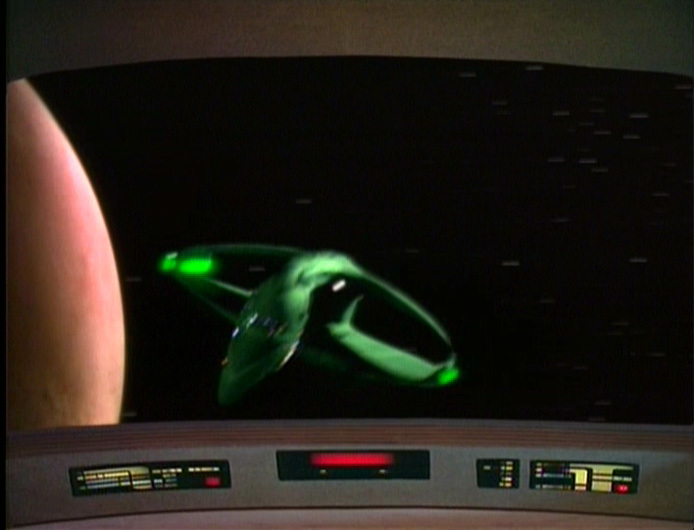 Another one of Worf's shadows, but they don't know that and they warp away to avoid the conflict. Scourge of the Alpha Quadrant, everyone. 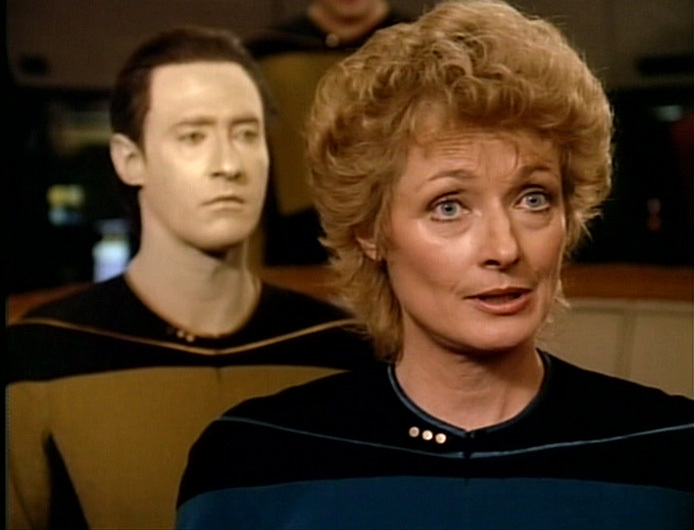 After Kolrami admits to underestimating Riker, and while they tow the Hathaway to the nearest starbase, Data challenges Kolrami to a rematch in Strategema. The game goes on and on racking up a record-setting number of points for both players. Eventually, Kolrami gets frustrated, quits and storms off. It's a stale mate. Data explains that since Kolrami was expecting him to play to win, he, instead, played for a stale mate and ignored obvious avenues of advancement, allowing the game to continue on theoretically indefinitely. In short... he "busted him up." I like seeing sniveling bureaucrats get shown up and frustrated and Kolrami is about as sniveling as they come. I also love it when a plan comes together. Brilliant strategies mixed with last-minute improvisations executed by quick minds; this is everything a good battle story should be about. High marks to this episode, for sure!